I was in a very relaxed time over the past couple days, and it appears to be a consequence of not using a daily planner / journal that I started using since the beginning of this year. I can already feel how the lack of maintaining a day plan significantly hinders my productivity. I find it very helpful to write down the things I need to get done on a given day. 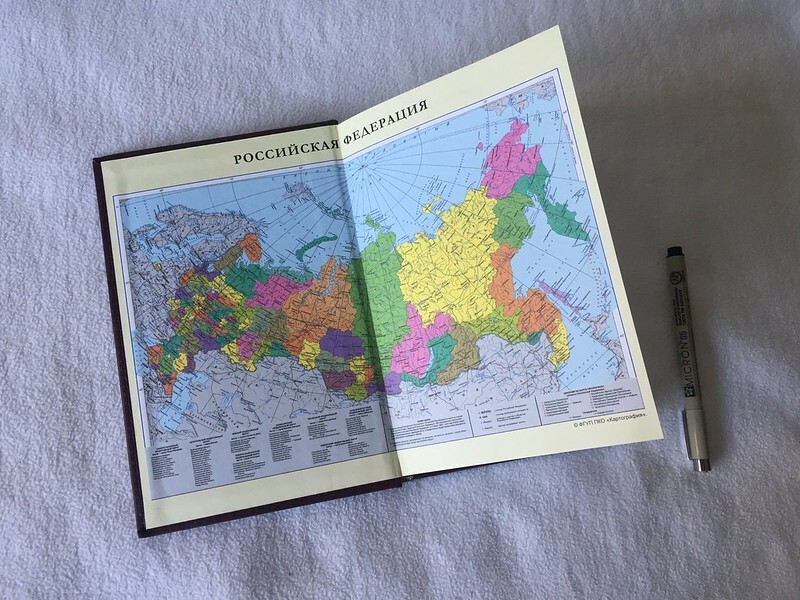 I started to maintain a daily journal which is similar to the one used by officials of the Russian Ministry of Foreign Affairs. And so, I want to talk about the motivations of using such a journal since one of them I find ironic. The words “Министерство Иностранных Дел Российской Федрации” (Ministry of Foreign Affairs of the Russian Federation) is written. 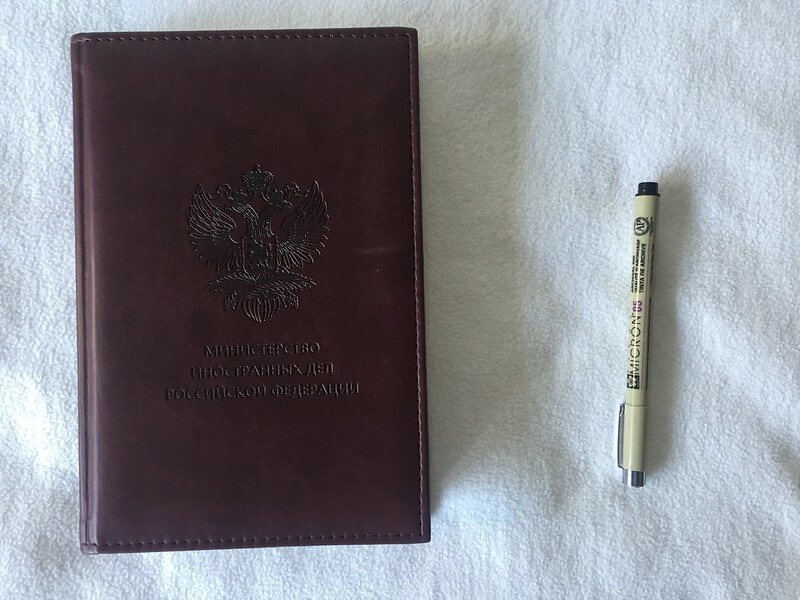 I got this journal in the summer of 2014 during my last visit to Russia from a family friend who works for the Russian government. She had this empty journal laying around in her car trunk and said that she receives hundreds of them. So she gave me this as a present and I imagined that one day, I will find the right time to start using it. Fast forward two years, and the time to start using the journal is probably the most appropriate that it could get. I now presumably posses the same object that the members of Ministry of Foreign Affairs do, which half of the US population accuses for interfering in their own political system. When you open the diary, the first thing that you see is the map of Russia. I would say the a map of Russia to a Russian is that same as an American flag is to an American. Both are found everywhere. My motivation to start using the diary, is therefore ironic, and it makes it even more ironic, because the taste for irony that I’m having while using this journal, imitates the sense of irony that Russian officials have towards the accusations that they receive. Thus, this journal is an irony directed towards both of the adversarial sides: one, is the American public believing in “17 intelligence agencies say Russia was behind hacking”, while the government did not declassify the full report that provides the proof. The unclassified report report can be found here, although it does provide pseudo-grounded proof that Russia used media to infiltrate the US’s public opinion, it does not include the actual details about the hacking (which might, or might not be included in the classified version of the report that is not shown to the public). I believe that the recent developments that occurred between the media and the US election, if anything, should have been a lesson for the American public to form their opinions based on primary sources, and not information digested by media. Unfortunately, this has not appeared to happen, and many where in a reactive state which was similar to the post 9/11 state, where decisions and accusations where made without a debate and completely desolated from public scrutiny. The second motivation for using my journal, is mostly pure irony. Assuming that Russia actually hacked the US election, I can now posses the whole range of stereotypes typical to the member of a clan that hacked the US election. Ultimately, I fail to see nations and states as anything beyond clans and until the public learns how to make up their own opinions, I will continue calling them clans. It all sounds primitive, but ultimately, this is the primitivity of human politics. As long as we continue having a malleable public, politics will remain as such, and this unfortunately, makes human coexistence on this planet more difficult and unstable. This not to say that I think a globalized world is better.